3. Shay No. 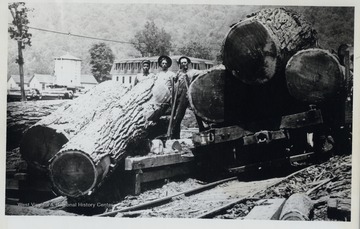 2 Meadow River Lumber Company, Rainelle, W. Va.
Shay No. 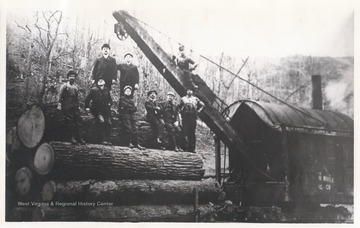 2 Meadow River Lumber Company, Rainelle, W. Va.
4. 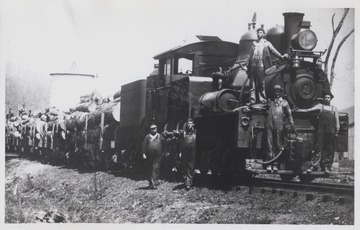 Logging Crew and Loader, Meadow River Logging Company, Rainelle, W. Va.
Logging Crew and Loader, Meadow River Logging Company, Rainelle, W. Va.
Logging crew posing on locomotive. 5. Shay No. 11, Cass, W. Va.
Shay No. 11, Cass, W. Va.
Photograp taken above the shops, Dynamite house in the background. 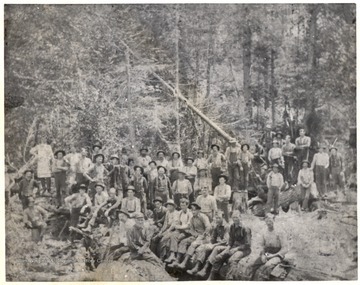 Group Portrait of Large Lumbering Crew in Woods. 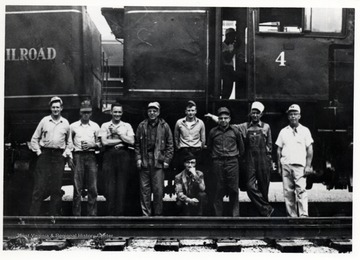 L. to R.: Leonard Long, Charles Queen, Kenneth Caplinger, Walter "Pop" Good, Robert Cassell, Percy F. "Bus" Long (Wheeling), Ivan Clarkson, Clyde Galford, Kyle "Catty" Neighbors; Cass, W. Va. 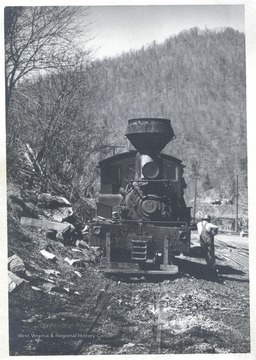 Train at Cass Yard, Cass, WV; Ivan Clarkson Collection. 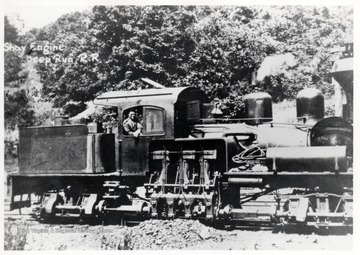 Locomotive engine on tracks. 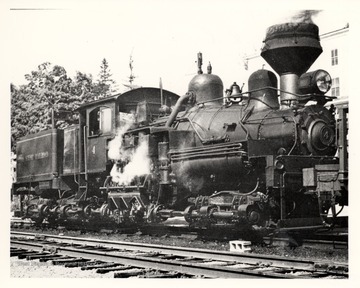 Cass Scenic R.R. Cass, W.V. 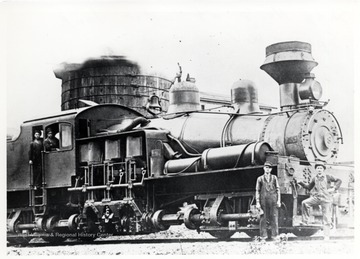 Locomotive engine with conductors. 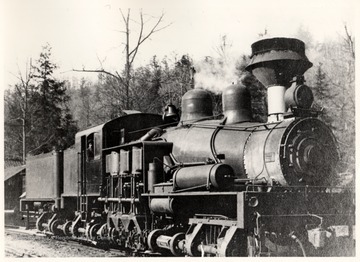 Cass Scenic R.R. 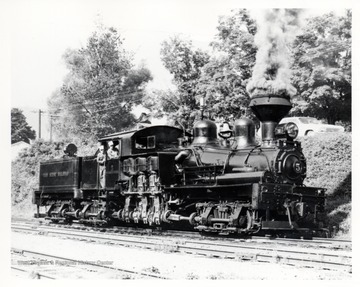 Cass, WV; Artie Bailey in the door; "Doc" Carlson at the throttle. 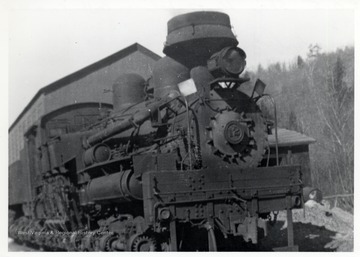 Shay Locomotive No. 8 at Water Tank in Spruce, W.V.